Moderate rainfall Tuesday and Wednesday could lead to new or continued river flooding. Posted on October 22, 2018 at 2:23 pm. Moderate rainfall Tuesday and Wednesday could lead to new or continued river flooding as well as some flash flooding concerns. All of South Central Texas, but the Colorado, Llano, Nueces, Frio, Guadalupe, and Rio Grande river basins are those most at risk from additional rainfall. 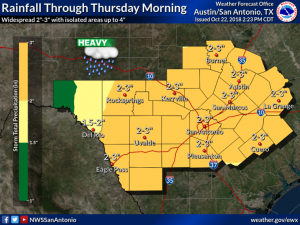 Rainfall: 2 to 3 inches of rainfall are possible across South Central Texas through early Thursday morning. Some isolated totals up to 4 inches are possible. The best chances for moderate rainfall will come Tuesday through early Thursday morning. 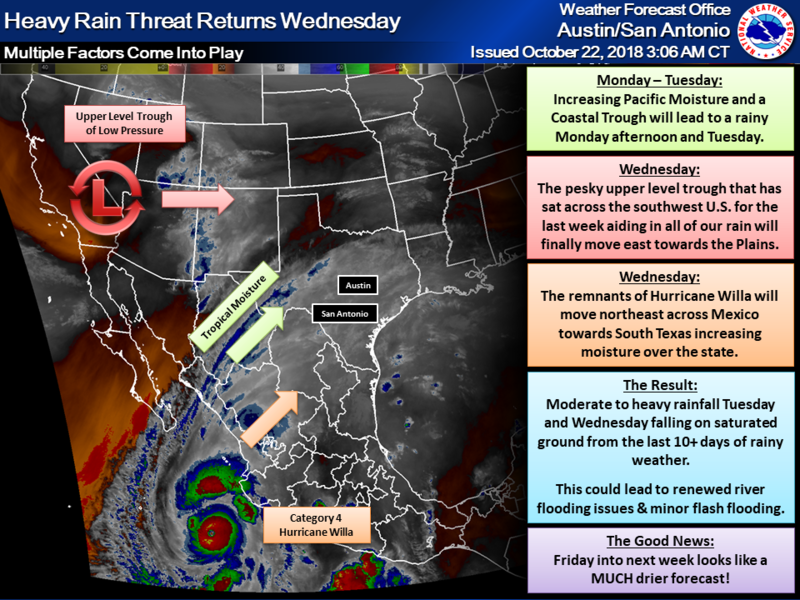 A coastal low off the Texas coast, remnants of Pacific Hurricane Willa, and a large upper trough moving across the Central Plains will all interact to bring good rain chances to South Central Texas Monday night through Wednesday. 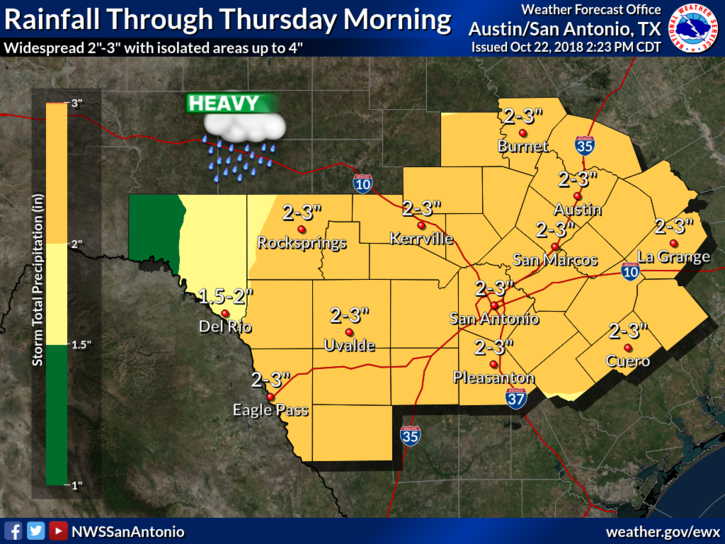 Moderate rainfall will be possible across most of South Central Texas Tuesday and Wednesday as these different weather features provide the lift and moisture needed for widespread light to moderate rainfall. New and continued river flooding will be the primary hazard, as well as some minor flash flooding concerns. With how saturated the ground is from the last 10+ days of rainfall, most of the rain that falls will turn into runoff and go directly into area streams, rivers, and lakes. Rivers in the areas that have seen the most rain (Hill Country, Edwards Plateau, and Rio Grande Plains) will be at the greatest risk as many are still in flood or at least at bank full/action stage. 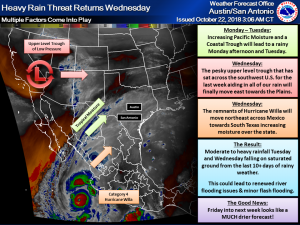 The upper trough exits Texas late Wednesday night into Thursday, pushing rain east of the region with a dry forecast through the weekend and into next week.